Back in November, I had walked by a little small restaurant a few steps away from Crowbar. I didn't pay much attention to it. A few days later, I walked past it again and people were enjoying brunch and instagramming. Poquito's eh? I looked it up and apparently, they serve up various Latin American and Mexican treats along with a selection of cocktails. So before going to watch Aquaman, Viv and I decided this would be a great place for some pre-movie drinks and eats. Since we arrived just a bit past opening at 5:00pm, I was able to take advantage of their Wings and a Beer. Although the portion was on the smaller side, the Alitas de Pollo were quite good. We got them dressed in sriracha revolver beet and tequila. 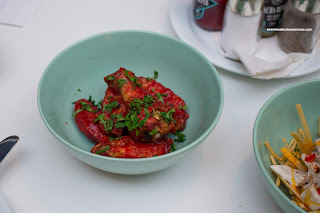 The wings themselves were moist and not overdone while the skin was slightly crispy and well-rendered. I found the beet flavour to be muted, but there was a balanced spiciness. 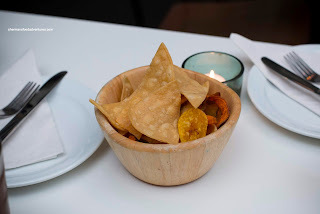 We were also served a complimentary bowl of Tortilla Chips and other root veggie chips. We enjoyed them being house-made, but they were on the greasier-side and some were not actually crispy. Whatever, they were a bonus anyways. Onto another appie, we had the Honduran Ceviche featuring coconut ginger lime snapper served with poquitos chips. This also had a noticeable heat to it, which was to our liking. 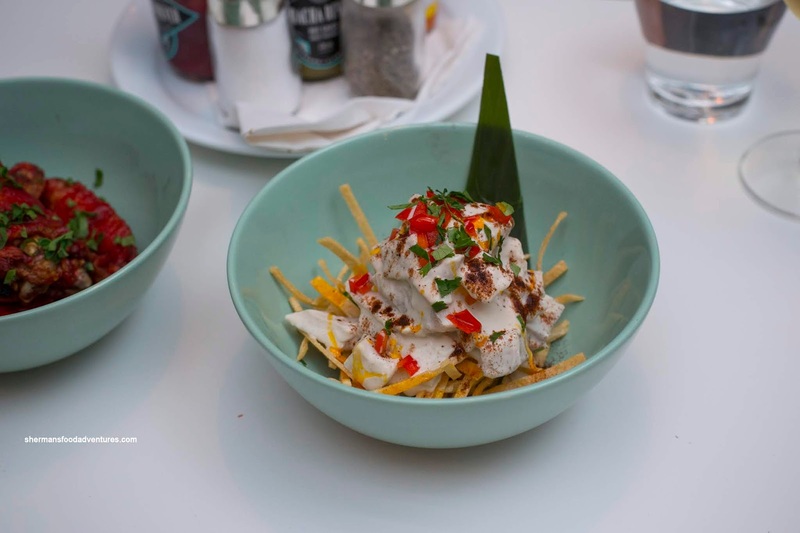 The fish was tender and fresh with the tropical taste of coconut and the brightness of lime as well as the sharp hit of ginger. 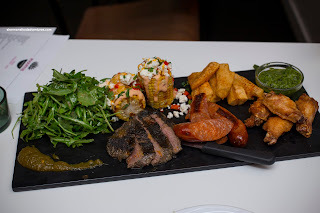 We felt the flavours were truly balanced which made the whole dish an enjoyable eat. 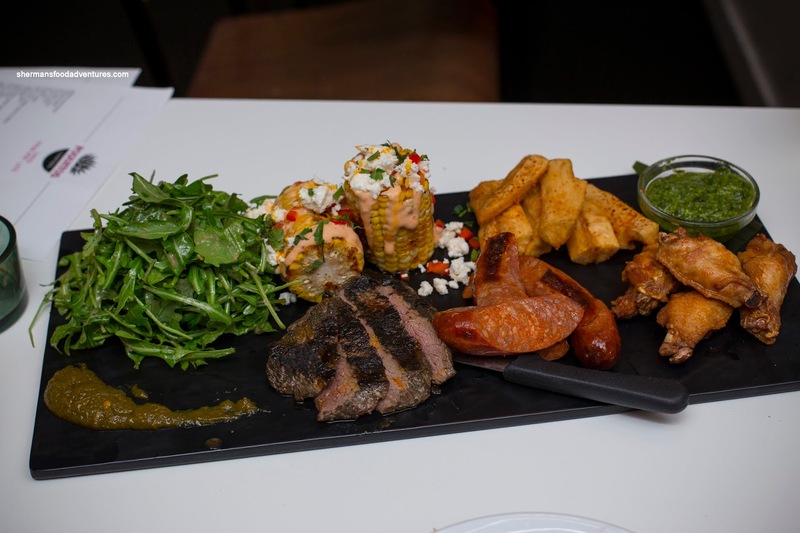 To get a taste of the menu, we ended up with the El Carne Way Platter for 2. This is a steal at $30.00 IMO. Since it included Alitas de Pollo once again, we chose a different flavour in Gigi's hot sauce and yes they were indeed spicy. Just barely not over-the-top, but definitely a good compliment to the beer. Yucca Fries were crispy while the smoked pear salad was mild and a nice cool-down from the spice. My favourite item on the plate was the Street Corn tossed in queso fresca, diablo sauce and cilantro. It was creamy, sweet and slightly smoky with spice. The meaty and tender chorizo was nice, but needed much more char and warming as it was cold. Finally, the sliced flank steak was nicely prepared being meaty and tender. The side of chimichurri was almost creamy and aromatic. Could've used more garlic punch though. 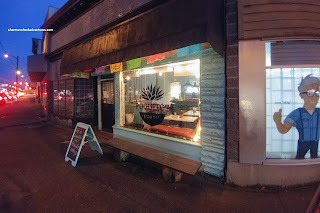 Overall, Poquitos was a pleasant experience from the food to the cozy dining space.